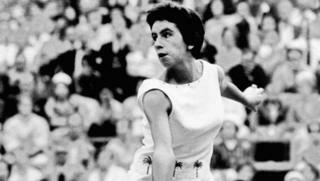 South America's most successful female tennis player, Maria Bueno of Brazil, has died at the age of 78. Brazilian President Michel Temer has led tributes to the star, tweeting that she would be remembered as "the number one of tennis in the hearts of all Brazilians". As she received the award, she said: "I'm not good, I'm afraid of everyone I play." She was labelled the "Sao Paulo Swallow" for her ability to dominate the net by former BBC Sport commentator John Barrett. Soon after news of her death, tributes to the tennis star began pouring in on social media sites. Brazilian tennis star Beatriz Haddad Maia said that Bueno "always showed a lot of fight", both on and off the courts. Thomaz Bellucci said she was "a pioneer in our country, where few people knew the sport and at a time when everything was much more difficult". A tweet posted on the official Tennis Hall of Fame account referred to Bueno as an "accomplished champion who leaves a lasting legacy of inspiration to generations".